The Columbus office of accounting firm HW&Co. has been growing steadily and tapping into new markets in Central Ohio and beyond. HW&Co. 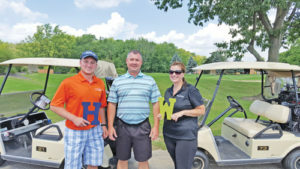 forges ties with employees through activities like golf outings and bake sales for nonprofits. Although smaller than the main Cleveland office, the Columbus branch of the certified public accounting and consulting firm has expanded business with health care, senior living, manufacturers, start-ups and nonprofit companies, says Anthony LaNasa, the managing principal for the office. Clients range from senior housing company National Church Residences to manufacturer Sam Dong America to the educational nonprofit National Inventors Hall of Fame. Gross revenue for the Columbus office has increased about 86 percent in the last nine years. LaNasa attributes that success to reaching out to different industries, providing a variety of services and leaving a personalized touch. That approach means the company rarely loses clients. “If you’re just looking for an accounting firm to fill out your paperwork, that’s not us. If you want a firm who wants to have the conversations with you, wants to know what keeps you up at night, wants to know where you want to be in three years or five years, that’s us. We like to stay fully engaged,” says Phyllis Sossi, brand strategist for HW&Co. HW&Co. is well-known in the health care industry. The accounting firm offers specialized services such as revenue cycle billing, help with coding and consulting. The company often works to help customers receive Medicare and Medicaid reimbursement, LaNasa says. About half of the firm’s business is focused on health care, but it also works with clients from several other industries. In fact, in 2014 the company rebranded from its original Howard, Wershbale, and Co. name in part to showcase its work in other fields, Sossi says. For instance, HW&Co. prospects Columbus-area tech start-ups through a partnership with Rev1 Ventures, an investor startup studio. HW&Co. donates free and discounted services such as setting up a general ledger, bookkeeping and filing taxes to new companies. “We’ll give away our services…with us knowing that maybe this company makes it, grows and we can grow with them and then obviously have a good client in the end,” LaNasa says. Lora Zotter, the director of talent programs for Rev1, says HW&Co. has pledged $25,000 a year for free or discounted services. She notes that legal and accounting services are critical for young companies. “Having those services can be the make-or-break difference for them to be successful,” Zotter says. The Rev1 partnership is just one part of HW&Co.’s philanthropic efforts in the Columbus area. HW&Co. also partners with the Crohn’s & Colitis Foundation, the Cystic Fibrosis Foundation and the Delaware County United Way among others. “[HW&Co.] 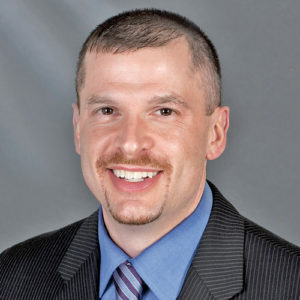 is an organization that is very much interested in giving back to the community,” says Brandon Feller, the president of the United Way of Delaware County. The company lends its expertise to the United Way’s Community Impact Council, which determines monetary allocations to local charities, Feller says. LaNasa and other HW&Co. employees have used their skills to dig into audits and tax returns of charities. Feller also appreciates the “extremely affordable” annual seminar that HW&Co. offers to area nonprofits. In addition to forging ties with the community, HW&Co. works to form bonds with its own employees. Many employees have been with the company for years. LaNasa, for example, has worked for HW&Co. since he graduated from college. More than half of the company’s other principals—often called partners at other firms—have done the same. HW&Co. 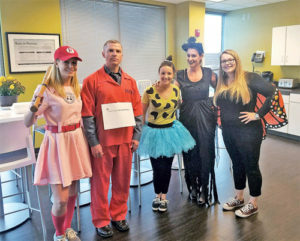 engages with employees by celebrating holidays like Halloween. “I saw it was a good firm, good people, good clients and that’s why I never left,” says LaNasa, who started at the firm in 1999. Rachel Smathers, a senior audit and accounting manager, likes the smaller office, company rapport and the open-door policy of the company’s principals. The atmosphere encouraged Smathers to stay with the firm after her previous employer CK&H, Inc., was acquired by HW&Co. in 2010. “Having this acquisition come in and having really good people come in helped us a lot, and it added credibility too because it was a good firm,” LaNasa says of the acquisition of CK&H, Inc. The acquisition of CK&H helped to “catapult” HW&Co.’s Columbus office to where it is today, LaNasa says. The office moved to its current building on Polaris Parkway in 2010, and has grown to 20 employees. LaNasa says they will continue to grow revenue and add employees.